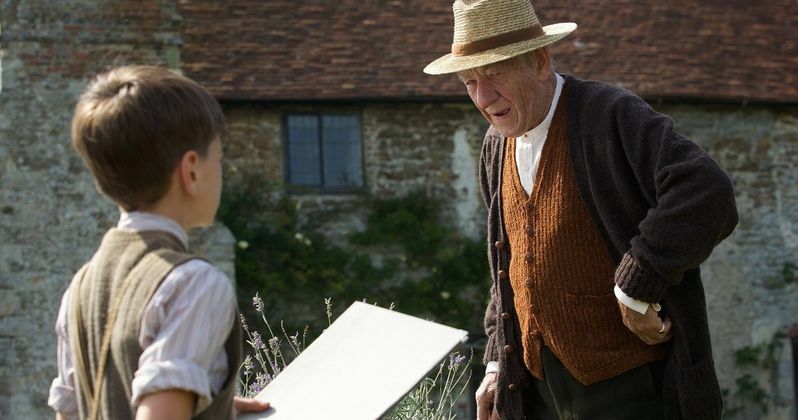 An aging Sherlock shares his story with a young boy in the first clip from Mr. Holmes, which stars Ian McKellen as the iconic sleuth. Based on Mitch Cullin's novel A Slight Trick of the Mind, this mystery thriller catches up with Holmes in his later years, irritated by the inflated tales of his past victories, yet ready to take on one last case. Mr. Holmes takes place in England, in 1947. The famous detective is now 93 years old, and lives in his Sussex country house. When he goes to the cinema and sees a film about himself, he mostly shakes his head. For much of what he is purported to have done in the heroic stories has simply been made up. He never wore the legendary hat and, rather than the pipe, he always preferred a cigarette. Long since retired, he steers clear of people and dedicates himself chiefly to bee-keeping.